Travelling through Egypt, I thought the best thing to do would be to engage with the local guides. I thought that they would be best-placed to show me the sights at a reasonable price, and I certainly appreciated their local knowledge. 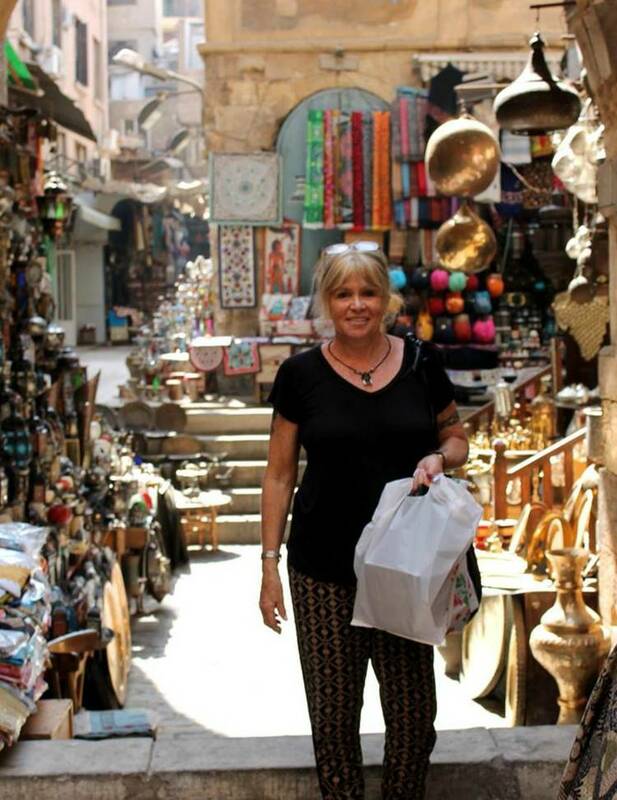 One of the ‘must do’ activities in Cairo for any self-respecting woman is to go to the biggest bazaar in the city. I found my local female guide online and together we headed to the bazaar district. It was an incredible place, with alleys full of fabulous things. I made a few purchases for friends, little blown glass bottles and small containers filled with oil. The prices were unbelievably cheap – roughly E£67, or the equivalent of AU$5 for a box of five. What a bargain! Especially considering they also packed them for me so that the bottles wouldn’t break. After lunch, my guide took me to a mosque and when we arrived she asked a man to sing a prayer. His voice echoed in the space all around me and took my breath away. It is one experience I will never forget. I finished my day enjoying a relaxing felucca ride on the Nile with my guide. The felucca is a traditional wooden sailboat of the Nile, it rarely has any form of engine and relies entirely on the breeze that builds during the day. Our felucca operator was an enthusiastic man, and I’d considered him quite attractive until he smiled and revealed a mouth seriously lacking in teeth. After arriving in the city of Luxor in Upper Egypt, I went in search of a local tour guide in order to arrange a hot air balloon flight for the following morning. I was completely surprised when one office I found quickly said the trip would not be a problem and informed me that it would be AU$60. If you have ever been on a hot air balloon flight over the vineyards in the Hunter Valley, you’ll know the prices can be upwards of $300, and for a moment I wondered what I’d booked myself in for. After agreeing to the price and arranging to be collected from my boat at 3am, the man I’d been talking to said his ‘sister’s uncle’s brother’ had a horse and buggy on the corner if I’d like to use that instead of a taxi. What incredible fun I had taking this travel option! Not only was I treated to some of the many sights of the historical city, but in the quieter streets, I was also permitted a drive. Like clockwork, a car pulled up at 3am and a man jumped out, opened the back door, ushered me in and quickly accelerated away. As we hurtled our way through the dark and narrow streets, the thrill of the balloon flight gave way to a sinking feeling that no one, including me, knew where I was. That tiny voice of doubt had started to convince me that I was being kidnapped, while the optimistic side was keeping my nerves at ease by reminding me that no one would bother kidnapping a woman of my age. I was somewhat relieved when a huge field with three balloons and a host of other people came into view, and I must be honest in saying that it was the best $60 I spent. 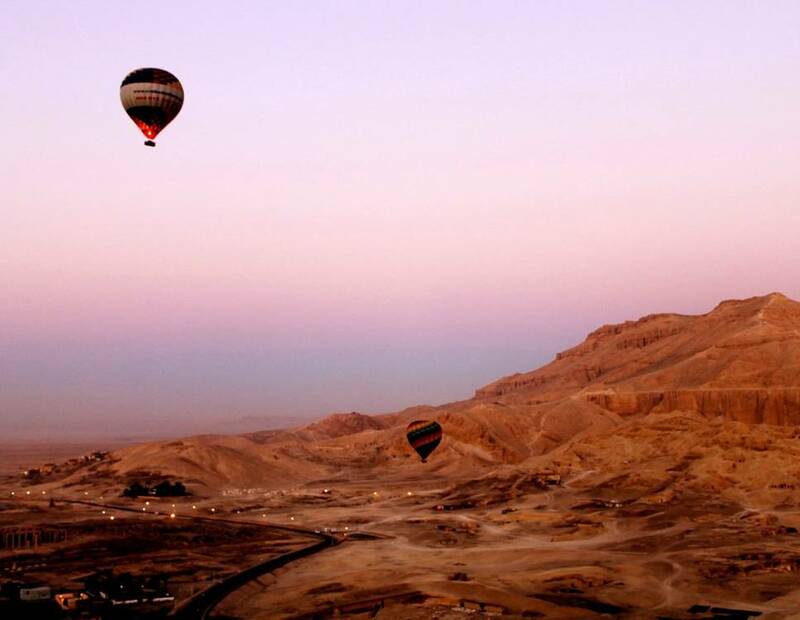 Flying over the Valley of the Kings as the first light started to push its way onto the horizon was incredible. We floated slowly and had as close to a bird’s eye view of the city and the Nile River. Going over some of the most famous ancient structures in the world really gave me perspective as to just how large this area is. Before we had even departed I had decided that I’ve loved cruising the Nile. The experience thus far was beyond my wildest dreams. I’d boarded the boat expecting to see around 60 people travelling with me, so you can imagine my shock when that number was quickly reduced to four, plus me! Thinking there would be a much larger group, I had arranged a private local guide to meet me at various stops along the way. This turned out to be a good move in the long run as the guide provided by the boat took people to more tourist-oriented places while I was treated to more local experiences. 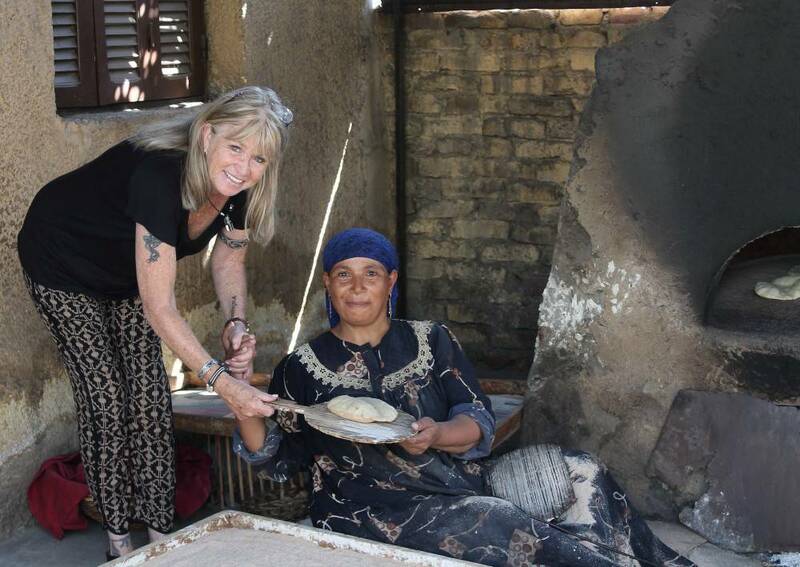 I even got taught to make pita bread. Considering my culinary skills there’s a miracle right there! My guide asked if I would take some photos of him for the website he was designing. We pulled up at the first stop, he jumped out and ran off. Just when I think that maybe he’s not coming back, he turns around and casually starts walking towards me, signalling for me to take the photo. He did this everywhere we went. When I returned home I emailed him the photos — they all looked the same! Having witnessed the enormity of the Valley of the Kings from above, I was now enjoying it from the ground though it was hot! I climbed the cliffs to take a photo looking down from above. I thought it would be deserted and an incredible memory to capture on film. It was amazing, but I couldn’t believe there was someone standing at the top selling postcards! I’m talking the sort that unfold to a metre long. He must sit up there all day waiting for tourists like me. The Temple of Philae at Aswan is so beautiful. It’s a large temple complex that was relocated to the island of Agilika with the building of the High Dam in Aswan so that it would be protected from flood. Back in Cairo, as I watched fireworks from a wedding reception for 500 people fill the sky I felt incredibly enriched. I had seen so much in my travels and had been so fortunate on all occasions.